The connection between the Goddess Isis and the Goddess Wisdom (Sophia in Greek; Chokmah in Hebrew) is an interesting one. In fact, some scholars think that the figure of Sophia was patterned after Isis. And they may well be right. So first, let’s have a look at Sophia, especially as portrayed during the Hellenistic period, the time following Alexander’s death to the rise of Rome. This is a period when the religion of Isis was strongly spreading throughout the Mediterranean world. It was during this time that most scholars believe the Book of Wisdom was written. The Book of Wisdom is one of the books of the Old Testament that is canonical to Roman Catholics and non-canonical to Protestants and Jews (though it may have been canonical earlier in Judaism). It is most likely that the Book of Wisdom was written in Greek, though it is stylistically patterned on Herbrew verse. One of the interesting—and important—things that the book does is to personify Wisdom. In Hebrew, Chokmah is a feminine word and so Wisdom, when personified, is a Divine She. In Greek, the language of the Book of Wisdom, this Divine She is Sophia. Though monotheists may disagree, I feel quite comfortable referring to Sophia as a Goddess, and so I shall for the rest of this post. So now we’ve met Sophia. Where does She meet Isis? 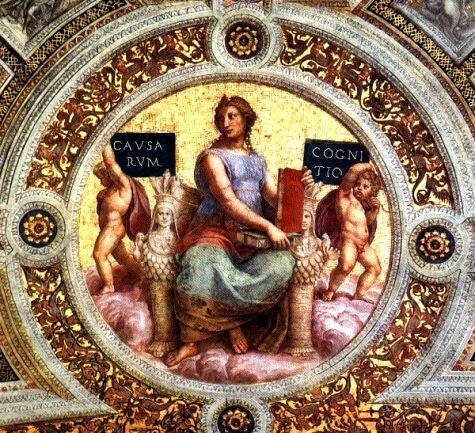 Raphael’s Sophia from the Vatican; note the two multi-breasted Goddess images on Her throne. These images of Artemis of Ephesus were identified as Isis by Raphael’s time. Another place scholars look for the influence of Isis on Sophia is in the structure and content of the famous Isis aretalogies—the praises of the Goddess in which the Goddess speaks for Herself (I am this, I did that…). Some have made a case for the structure of the Book of Wisdom paralleling the structure of a number of the Isis aretalogies and they list the parallels in the epithets of Isis and Sophia. As is natural in scholarly circles, there are criticisms of all these approaches as well. In an article in the Harvard Theological Review (“Isis & Sophia,” Vol. 75, No. 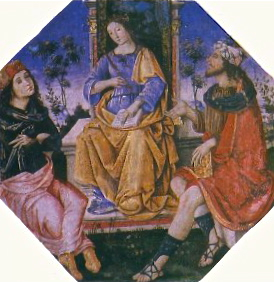 1, 1982), John Kloppenborg contends that the reason Sophia is so strongly personified in the Book of Wisdom is because of the challenge to Judaism presented by Isis. In his view, it’s not so much that the Wisdom writer directly borrowed things from the myths, aretalogies, or hymns of Isis, but rather that the writer felt the need to counter the Isiac qualities so prevalent in the culture with corresponding Sophic qualities. He believes the attributes of Sophia in Wisdom were especially chosen to take on, one-to-one, the attributes for which Isis was so well known at the time. For example, the Book of Wisdom presents itself as advice to kings; as the Goddess Throne, Isis was intimately associated with the kingship. In the Book of Wisdom, Sophia functions as a Savior, just as Isis so famously does during this time. In older Jewish tradition, while Sophia is a life-giver and a wise counselor, She is not a Savior. Now—perhaps due to the influence of the Isis religion—She is. Kloppenborg also notes the correlation of Isis’ cosmic power in the aretalogies, in Plutarch, and in Egyptian tradition with Sophia’s cosmic rule and regulation in the Book of Wisdom. Sophia’s guidance of Noah’s ark counters Isis’ role as Euploia, guide of ships and sailors. In Wisdom, Sophia is the spouse of God and of the king—just as Isis is spouse of a God and mother of the king. Sophia protects the “righteous man,” grants the ability to rule, and has “knowledge of all holy things.” Isis gives to “all who are righteous” great blessings (Hymns of Isidorus). As the Goddess Throne, She grants the right to rule, and She was always, always been the Lady of Knowledge. Kloppenborg significantly argues that the correspondences between Isis and Sophia gave the Jews of Alexandria a way to talk with their Pagan neighbors. 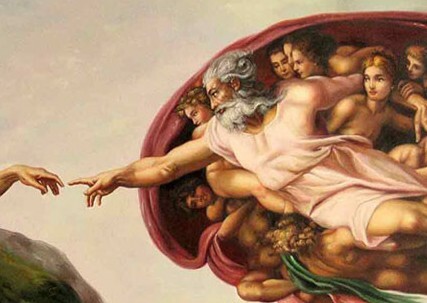 Outside of the Book of Wisdom, for instance, we know of Jewish philosophers who compared their religion’s Mysteries with those of Orpheus and Isis. Many of the names of Isis from the later Invocation of Isis in the Oxyrhynchus papyri show Her clear identity as a Goddess of Wisdom. Anyone writing about a Wisdom Goddess and living in that culture would naturally look to Isis as a model. 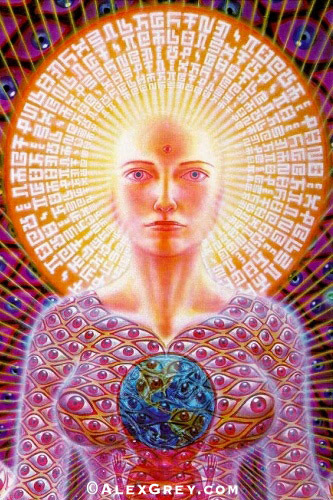 The writer of the Book of Wisdom seems to have done so as did the Gnostics who wrote about their own Sophia—and Whom we haven’t even touched on here. But I’ve written enough for today so that will be a story for another day.